This year, skip the Halloween store—and the generic costume. Instead of pulling something pre-made out of a plastic bag, shop around and concoct the perfect outfit. Here are some timely costumes to try this Halloween. Let’s get the most obvious option out of the way. There will probably be a lot of people slinging baseball bats this year—but popularity is also the sign of a good costume, so if you want to go the Quinn route, we’re here to help. We recommend a baseball tee, hot pants, fishnet leggings, a baseball bat, and lots of red and blue hair dye. You can take the look a step further with a Puddin’ necklace and Joker jacket. Sure, you can pick up a Ghostbusters suit at the store, but we know you’re looking for something a little less obvious. Consider being Erin when she’s off duty. You just need an MIT sweatshirt, jeans, and rain boots. If you don’t want to sacrifice style when dressing up this Halloween, you might as well be the beloved toothless jokester from the new hit Netflix show, Stranger Things. All you need is a tri-color hat, green graphic tee, brown corduroy pants, and a denim jacket. The exact plaid-lined jacket Dustin wears might be hard to find, but you can always mix a navy jacket with a red plaid shirt. 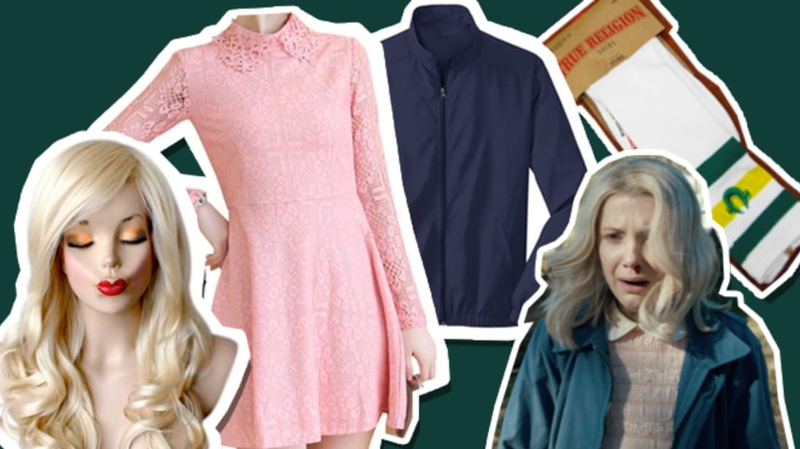 For another take on Stranger Things, dial it up to Eleven by buying a long sleeved pink dress, navy jacket, athletic socks, and a blonde wig (optional). Telekinetic powers sold separately. Social media mavens can cover a lot of bases with this costume, which can be either the dog emoji or the dog filter in Snapchat—and it's relatively easy to pull off. Just grab some face paint and some brown or piebald ears. Getting the perfect Judy look will be a total snap. Basically all you need to do is combine two costumes—a police officer and a bunny. Instead of hopping over to the nearest costume store, look online for these things: a light blue turtleneck, a navy vest, blue leggings, a police badge, bunny feet, and ears. We don't blame you for envying Pablo Escobar's impressive sweater game in the second season of Netflix’s show Narcos. Thankfully, it won’t be hard to steal this drug lord’s look for Halloween, especially if you have a mustache. All you need is a white button down, khakis, and of course, Pablo's amazing handcuff knot sweater. Princess Carolyn has had a tough year this season, but that doesn’t mean she won’t land on her feet (she is, after all, a cat). Celebrate the former agent’s new job as a manager by dressing up as Amy Sedaris’s character this Halloween. Pick up a yellow cardigan, teal dress, triangle necklace, red pumps, pink wig, and cat ears. Netflix's The Get Down has great characters, catchy music, and stylish outfits. Get the main character's retro look with a navy polo shirt, a navy cable sweater vest and brown bell-bottom pants. You can be pretty much any character from Netflix’s show, Orange is the New Black, with the help of a pair of tan scrubs. Couple that with a pair of black boots and it’s simply a matter of styling your hair. Some inmates also like to wear a shirt underneath their scrubs, so pick your character and look into that before you buy. Obsessed with Pokemon Go? Prepare to rock the easiest couple costume of all time. You can pick up a Pikachu or Charmander onesie and immediately transform into a Pokemon. Then, just have a similarly Pokemon Go-obsessed friend or significant other follow you around with their phone out. Ilana has so many insanely fun outfits that it seems criminal to just choose one. In one episode, Abbi dresses up like Ilana in an elaborate co-op con job. Since this costume can also be Abbi as Ilana, it seems like the most fun costume choice. To perfect this look, you need a leather fanny pack, tie-dye leggings, mesh crop top, and Ilana’s signature bralette. Bonus points if you also get her hot dog phone case.